Halloween is only a few weeks away! 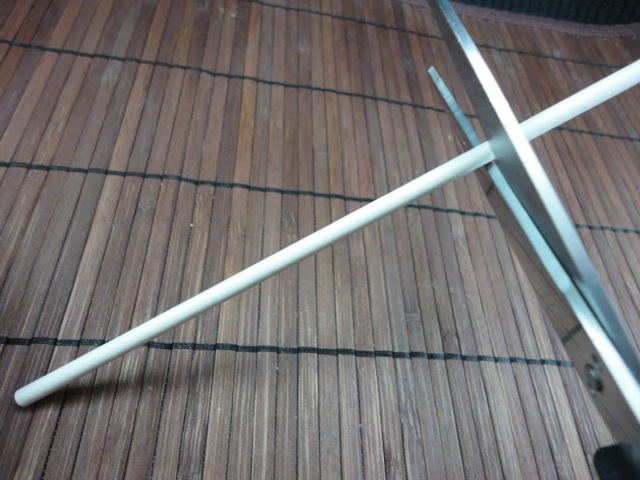 Do you want something fun to make? 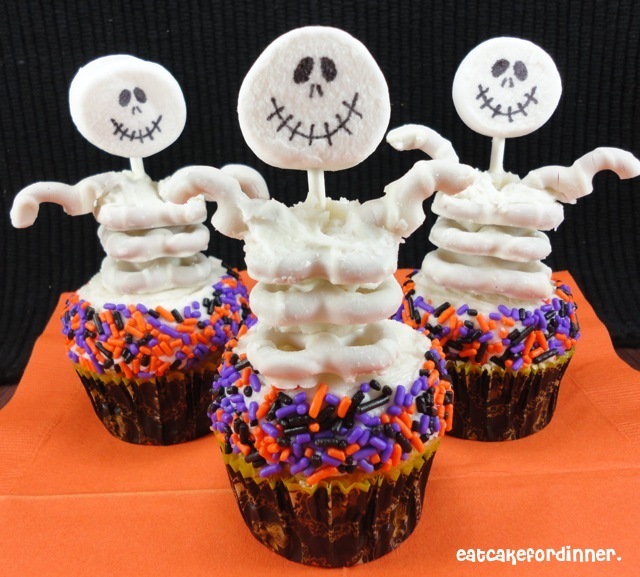 You should make these skeleton cupcakes! They are not like those other "fun cupcakes" that are decorated really cute, but you would never want to actually eat all of the candy on them? With these, you have one marshmallow - yum! White chocolate covered pretzels - yum! And frosting with sprinkles - double yum! But if you don't actually want to eat the skeleton part, all you do is remove the body in one part, you won't have to sit and pick off all of the candy! 1. Put a mound of frosting onto your cupcake. Smooth out the top and the sides. It doesn't have to be perfect, because the sprinkles will cover it up. Make sure and reserve some frosting for attaching the pretzels. 2. 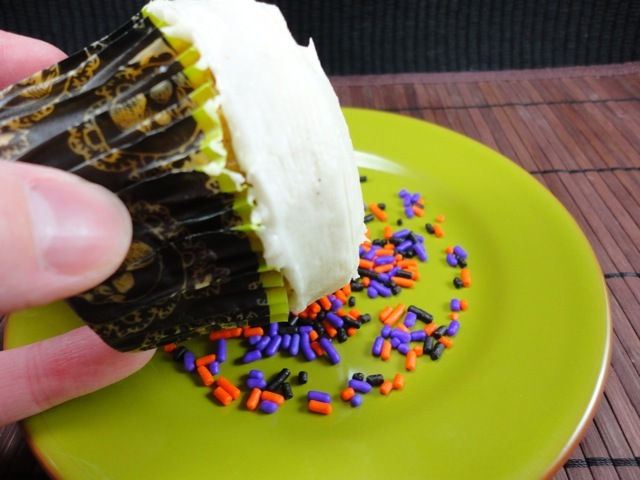 Pour your sprinkles onto a plate and roll the sides of the cupcake into them until completely coated. Press sides slightly to make sure the sprinkles are attached. 3. Depending on what size sucker sticks you have, you might need to trim a few inches off one end. It depends on how tall you want your skeleton to be. 4. 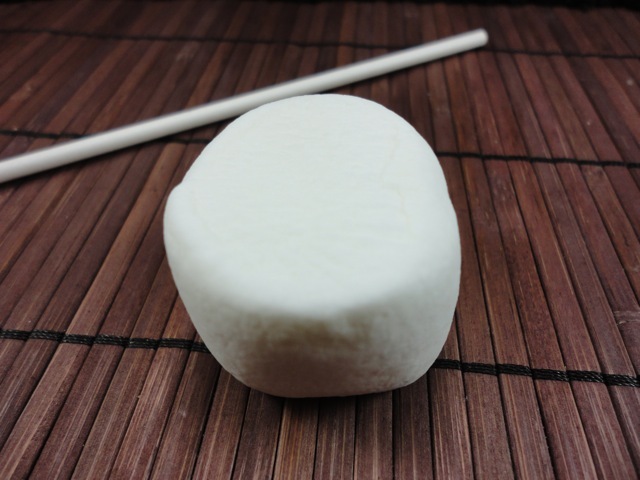 Take a large marshmallow and flatten slightly with the palm of your hand. 5. 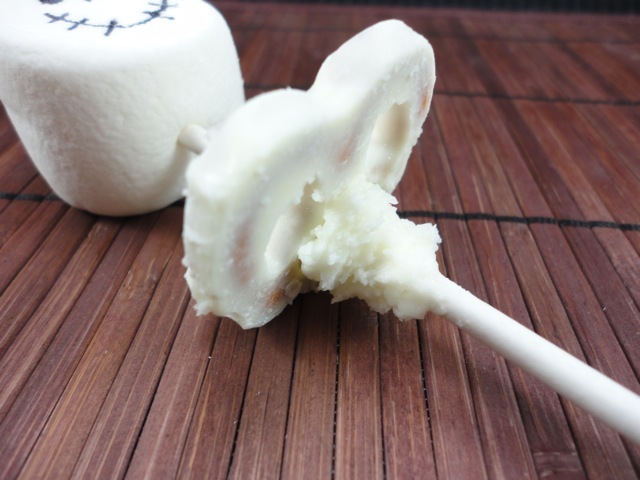 Insert your sucker stick into the mallow. 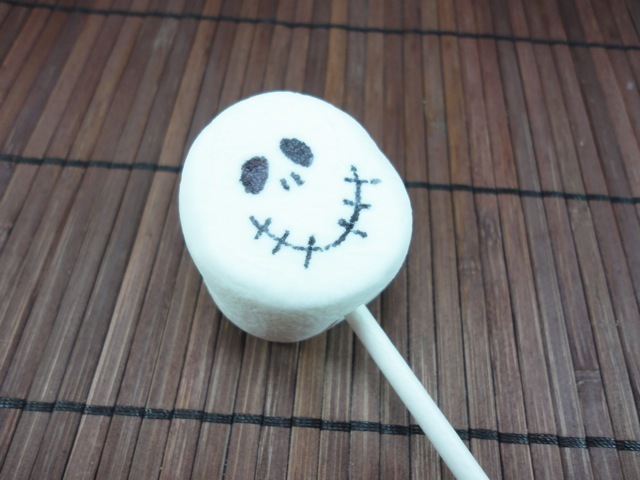 Use a food marker to draw a funny skeleton face onto the face of the mallow. 6. Now you need to adhere the white chocolate covered pretzels to the stick. The easiest way I found was to take a small amount of frosting and fill the bottom circle of the pretzel, then insert the sucker stick into that bottom circle and slide up to place. Then, smooth the frosting around the stick and the hole of the pretzel. Repeat with remaining pretzels. I added three. Don't worry about it looking messy. You really can't see the frosting on the finished skeleton. 7. 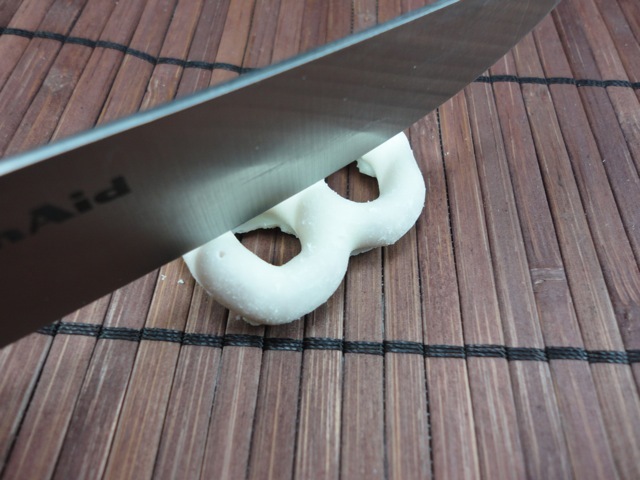 To make the arms: Use a sharp knife and carefully cut off the top part of the pretzel. 8. Dip one end in frosting. 9. Insert the frosting covered end into the front hole of the top pretzel. You can either have the arms straight to the sides or angled up a bit. Repeat with other arm. 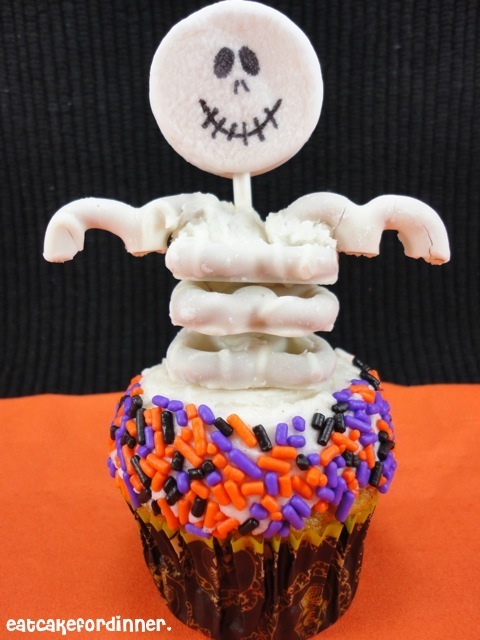 Then, I let the frosting harden a bit before I added the skeleton to the cupcake. When frosting has hardened, carefully pick up the skeleton and press the bottom of the sucker stick into the center of your cupcake. Repeat with remaining skeletons. Enjoy! Those look awesome and delicious with it! Yummy! Those are so cute! Very creative and very yummy. 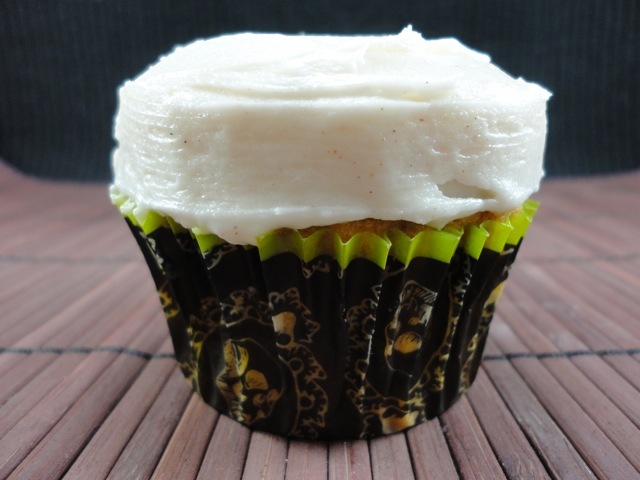 Those cupcakes make me wish I weren't gluten-free! They are so cute! How FUN! My kids would love this! Thanks for sharing! super adorable! Picking up marshmallows and white chocolate covered pretzels stat. These are cute and fun. All the little *goblins* that come out this time of year are going to love them. Hey Jenn! I am hosting a Halloween Edition Link Party! 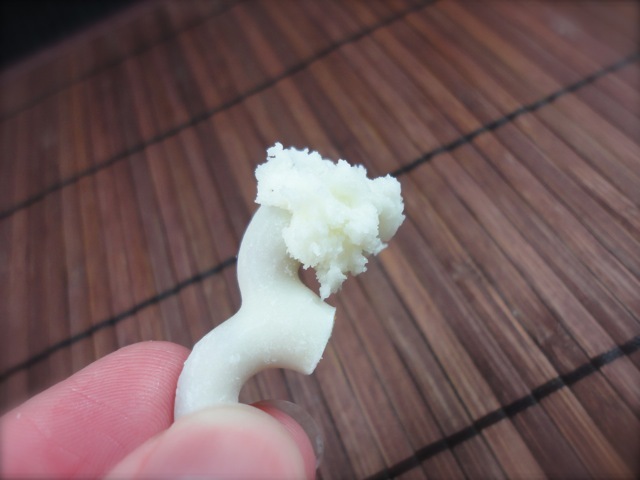 You should come link this adorable recipe up! My readers would LOVE it! !